The Matador women’s basketball team will play the University of South Carolina’s Gamecocks on March 23 in the NCAA Division I Women’s Basketball Championship in Seattle. 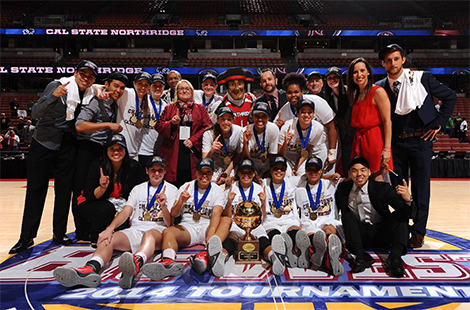 Led by Big West Player of the Year Ashlee Guay, the Matadors defeated Cal Poly on Saturday winning the Big West Tournament for the first time. The Matador men came up just shy of making the Big Dance as well, losing in the final seconds of the championship game. Read more about the tournament. CSUN’s Valley Performing Arts Center (VPAC) hosted “Jim Henson’s Sid the Science Kid: Live!” and a student-led science demonstration fair following the performance. Read more about the family event. On a recent evening at CSUN, Elaine Hall guided nearly 30 special education teachers through a lesson on what it’s like to be autistic. Read more about their experience. Wed., March 19, 3 p.m. Sat., March 22, 8 p.m. Internationally acclaimed American dance troupe. Wed., March 26, 6:30 p.m. Alumni will discuss turning your passion into your career. Dozens of students, faculty and alumni attended CSUN’s ninth annual Environmental and Occupational Health Symposium on March 5. CSUN’s MBA program rose 32 spots in U.S. News & World Report’s ranking of “Best Part-Time MBA Programs” released last week.